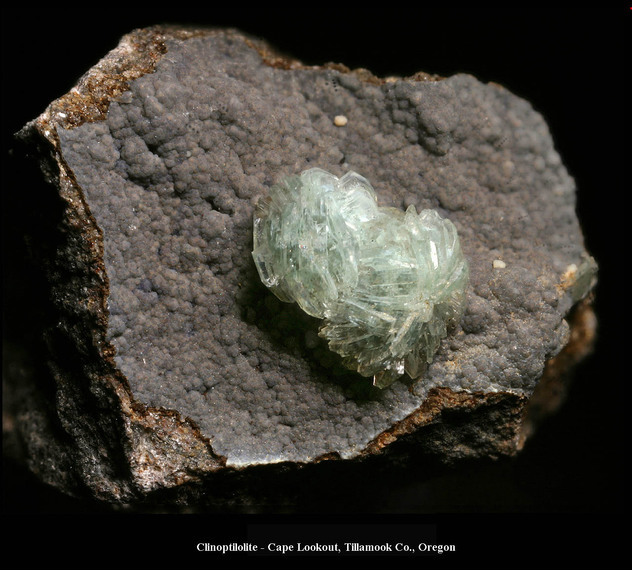 Clinoptilolite-Ca: Mineral information, data and localities. Generally not pure but containing additional Na and/or K. Formula previously given as (Ca,Na,K)2-3Al3(Al,Si)2Si13O36.12H2O. From the Greek klino - "oblique" ptylon - "feather" and lithos - "stone." The Ca-dominant member of the clinoptilolite series. 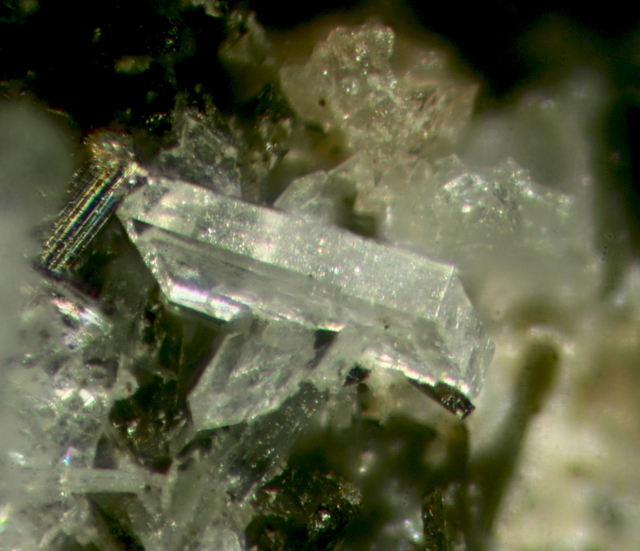 The calcium analogue of Clinoptilolite-K and Clinoptilolite-Na. Clinoptilolite-Ca-Heulandite-Ca Series. Koyama, K. and Y. Takeuchi (1977) Clinoptilolite: The distribution of potassium atoms and its role in thermal stability. Zeitschrift für Kristallographie: 145: 216-239. Mordenite 12 photos of Clinoptilolite-Ca associated with Mordenite on mindat.org. Erionite 7 photos of Clinoptilolite-Ca associated with Erionite on mindat.org. Celadonite 5 photos of Clinoptilolite-Ca associated with Celadonite on mindat.org. Erionite-K 3 photos of Clinoptilolite-Ca associated with Erionite-K on mindat.org. Dachiardite-Ca 3 photos of Clinoptilolite-Ca associated with Dachiardite-Ca on mindat.org. Clinoptilolite-Na 2 photos of Clinoptilolite-Ca associated with Clinoptilolite-Na on mindat.org. Amethyst 2 photos of Clinoptilolite-Ca associated with Amethyst on mindat.org. Chalcedony 2 photos of Clinoptilolite-Ca associated with Chalcedony on mindat.org. Calcite 2 photos of Clinoptilolite-Ca associated with Calcite on mindat.org. Dachiardite-Na 2 photos of Clinoptilolite-Ca associated with Dachiardite-Na on mindat.org. Alberti, A. (1972) On the crystal structure of the zeolite heulandite, Tschermaks Mineralogische und Petrographische Mitteilungen: 18: 129-146. Armbruster, T. (1993) Dehydration mechanism of clinoptilolite and heulandite: Single-crystal X-ray study of Na-poor, Ca-, K-, Mg-rich clinoptilolite at 100K. American Mineralogist: 78: 260-264. Coombs, D., A. Alberti, T. Armbruster, G. Artioli, C. Colella, E. Galli, J. Grice, F. Liebau, J. Mandarino, H. Minato, E. Nickel, E. Passaglia, D. Peacor, S. Quartieri, R. Rinaldi, M. Ross, R. Sheppard, E. Tillmanns, G. Vezzalini (1997) Recommended Nomenclature for Zelite Minerals: Report of the Subcommittee on Zeolites of the International Mineralogical Association, Commission on New Minerals and Mineral Names. The Canadian Mineralogist: 35: 1571-1606. Esenli, Fahri and Isik Kumbasar (1998) X-Ray Diffraction Intensity Ratios I(111)//(311) of Natural Heulandites and Clinoptilolites. Clays and Clay Minerals: 46(6): 679-686. Snellings, R.A., Gualtieri, A.F., Elsen, J. 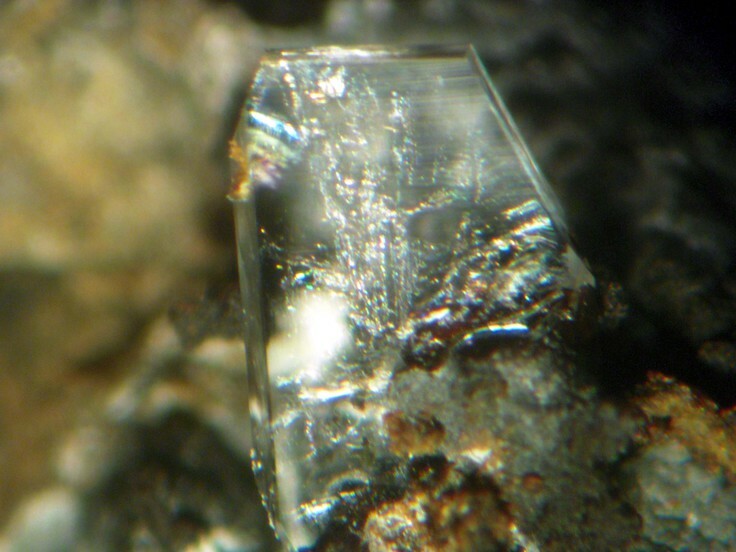 (2009) The Rietveld structure refinement of an exceptionally pure sample of clinoptilolite from Ecuador and its Na-, K-, and Ca-exchanged forms. Zeitschrift für Kristallographie Supplements: 30: 395-400. Kolitsch, U., Schillhammer, H. & Lamatsch, P. (2015): 1936) Analcim, Axinit-(Fe), Chamosit, Datolith, Gips, Heulandit-Ca, Hyalit, Jarosit, Klinochlor, Klinoptilolith-Ca, Laumontit, Malachit, Molybdänit, Siderit, Sphalerit und Uraninit vom Steinbruch Hengl bei Eibenstein an der Thaya, Waldviertel, Niederösterreich. Pp. 243-245 in Niedermayr, G. et al. (2015): Neue Mineralfunde aus Österreich LXIV. Carinthia II, 205./125., 207-280. Encheva, S., Petrov, P., Chukanov, N., Pekov, I., Енчева, С., Петко, П., ... & Пеков, И. Dachiardite-K from the area of Austa village, Momchilgrad municipality, Eastern Rhodopes–a new mineral species of zeolite group Дакиардит-K от района на с. Ауста, община Момчилград, Източни Родопи–нов минерален вид от групата на зеолитите. PE-PIPER, G. and MILLER, L. (2002) Zeolite minerals from the North Shore of the Minas Basin, Nova Scotia, Atlantic Geology, 38, 1, 11-28. P.Pauliš,L.Hrůzek,O.Janeček,J.Sejkora,R.Malíková,F.Fedyuk(2014)Dachiardite Ca and associated mineralization from Doubice-Vápenka near Krásná Lípa(Czech Rep.),Bull.Miner.-Petrolog.od.Národní Muzeum Praha,22,1,2014. Wise, W.S. and Tschernich, R.W. (1976): Dachiardite-bearing zeolite assemblages in the Pacific Northwest, in: Sand, L.B. and Mumpton, F. (eds. ): Natural Zeolites Occurrence, Properties, Use. Pergamon Press (Oxford, New York), pp. 105-111.